Home » Blog » Blog » How to Series » How does a Breakaway Kit Work? Have you ever been driving along with your trailer in tow only to stop at a red light and watch your trailer go barreling through the light? No, we haven’t either because Snapper Trailers follows all of the perceived safety tips in hooking up the Trailer Breakaway kit. Here’s more information about Breakaway Kits. What is a Breakaway Kit? 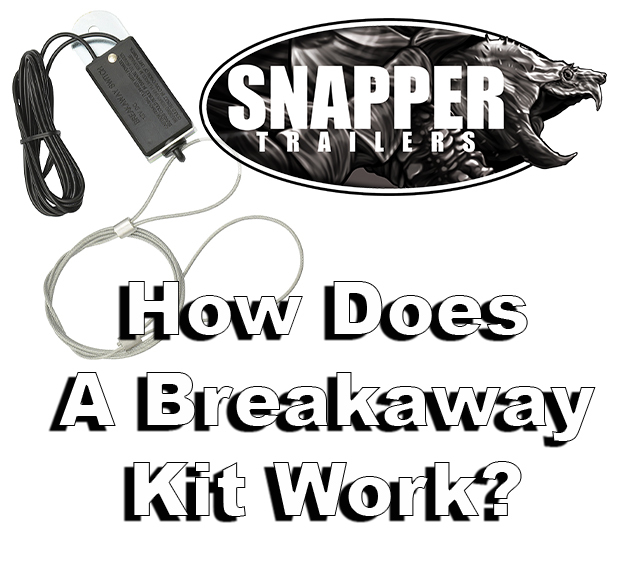 A breakaway kit is that of small cable and battery combination that hooks up to your auxiliary power wire that if the trailer comes off the ball, snaps the chains it would be the last case of the trailer stopping by itself before further damage is done. How do Breakaway Kits work? in the event the trailer coupler should come off of the trailer ball, the safety cables come undone it’s up to the key within the breakaway kit engages causing the trailer (with brakes) to stop the trailer. The included rechargeable battery hooked up to the auxiliary power wire is connected through the 7-pin connection. When the trailer brakes are engaged by the breakaway battery they are held for at least 15 minutes unless of course the power connection is severed. Be sure to make sure your next trailer has brakes and the brake controller is present to help keep yourself, your belongings and everything around you extra safe and sound. Contact Snapper Trailers with any further questions or concerns. Thank you! Tip: Snapper Trailers recommends looping the breakaway cable in a loop a couple of times around the vehicle side brackets which also have the safety chains affixed and then held in by the safety chain spring loaded S loop. If you’re unsure be sure to have the Snapper Trailer representative show you how during your next visit. Previous: NATDA Trade Show (Indianapolis, IN) | Was A Huge Success! Next: Don’t Forget About Your Trailer Brakes!